As Black History Month concludes, we would like to share with you our involvement in a special project that has brought together like-minded organizations and individuals: "Dream of a Nation." 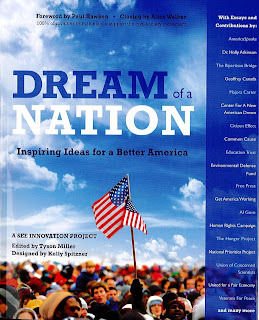 This project, a glossy, 446-page book of essays highlighting a people-centered initiative focused on big dreams, bold innovations, and realizing our full potential as a nation, is an effort to elevate awareness and inspire action around a range of critical social, environmental, and economic issues. Essays highlight such issues as waging peace, strengthening community, media reform, people-centered government, ending poverty and more. 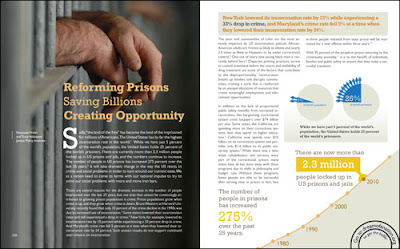 Our essay, "Reforming Prisons, Saving Billions, Creating Opportunities," attempts to explain the dramatic increase in the U.S. prison population over the last quarter century and suggests alternatives on making smart investments in our communities and social institutions. Like in our research on racial disparities published over our 15-year tenure, the essay points out that African-American adults are four times as likely as whites and nearly 2.5 times as likely as Hispanics to be under correctional control. Because the Justice Policy Institute's mission is to first consider the people, families, generations impacted by our country's criminal justice policies, we feel that the time is now for us to advocate, impact, and influence. Particularly, with the racial disparities that exist as a result of our unjust system, JPI wants to bring light to the fact that we must work together in our efforts to reform. Let's change our history into a positive, reformed present and future. Consider ordering the book today by clicking here. If you like our work, help support our efforts. 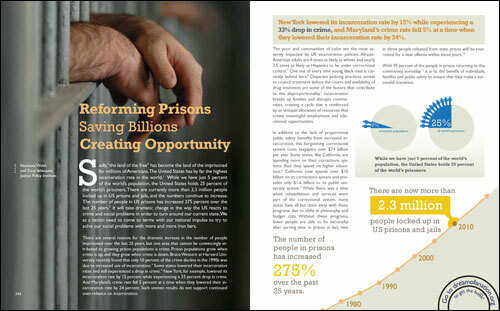 Because of people like you, JPI has been the catalyst for the debate on criminal and juvenile justice reform over the last 15 years.